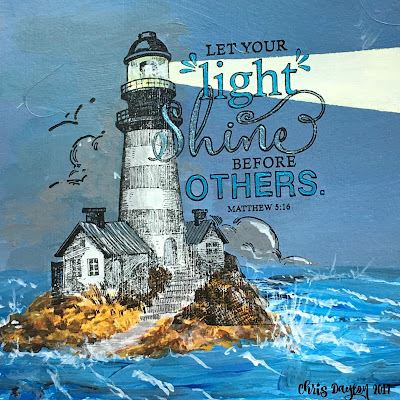 Today I am sharing a project from my art journal using one of the new June Technique Junkies stamps, Let Your Light Shine. I began my project by adding a thin layer of gesso to my pages. When dry, I used my large Memory Misti to add the stamp to the left hand page. I first placed the page into my MISTI with the lower edge at the bottom edge of the MISTI, with the remainder of my soft-covered journal sticking out of the Misti. I carefully noted where the left edge of my page was on the back grid lines and placed a strip of washi tape at that line, so I could easily line it up again. 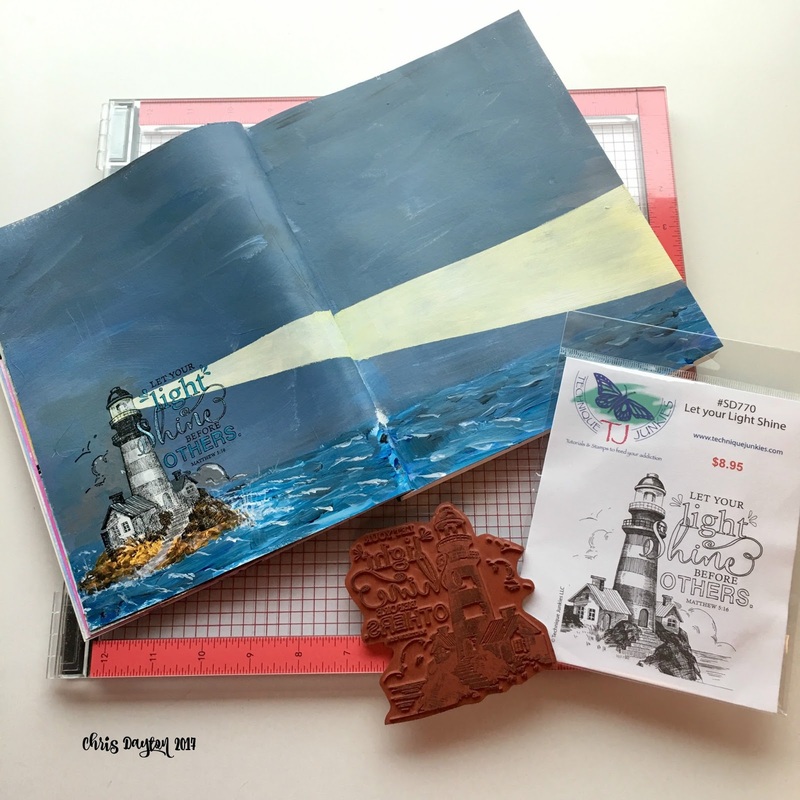 I inked up my stamp and stamped directly on the gessoed page with Versafine ink. I left my stamp in the MISTI for later. 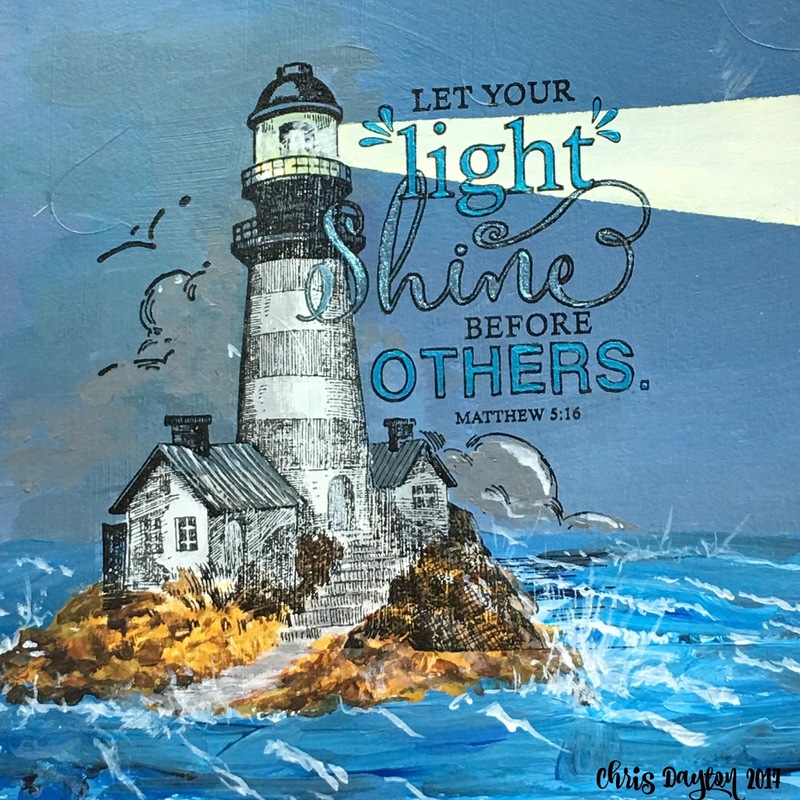 This stamped image is my guide. I used acrylic paints to paint in the background sky and water. I also added some color to the island ground. When dry, I placed the journal back into the MISTI and restamped my image a second time. Because it was placed in the exact same spot in my MISTI, it stamped in the exact same place. Again, I left the stamp in my MISTI. Now I painted a few more details in the buildings, and the rocks, in the clouds and lighthouse. I also added the buttery yellow light beam. 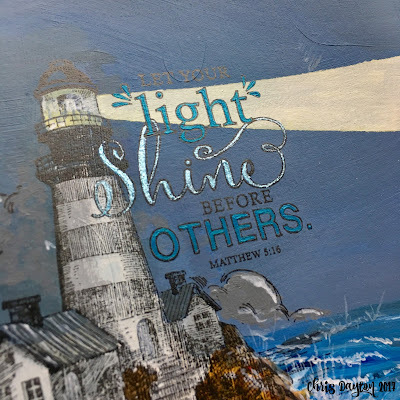 Each layer of paint that I add hides some of my stamped image, so before I paint in the sentiment, I need to stamp once more. Again, I am able to line up my page in the same spot so that I am stamping in the exact same spot on my page. This will be my final stamping. Now I am able to paint in the lettering, and add the waves and the water spray on the rocks. Thanks for visiting today. Please drop a comment and let me know you were here, or if you have any questions. To see more of these fantastic Technique Junkies stamps, click HERE. Feel free to use this code to save 10% on your order.